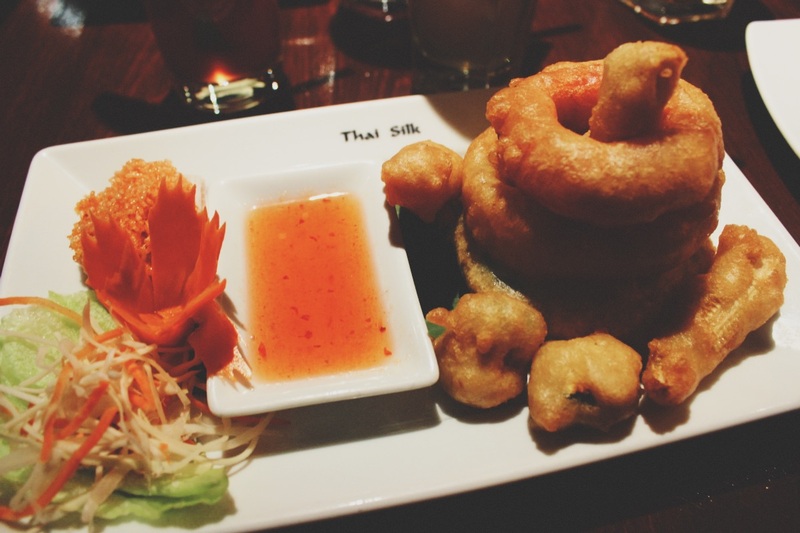 A few weeks ago I was invited along to review a complimentary meal at London hotspot, Thai Silk. Having only recently discovered the delights of Thai cuisine, I was looking forward to trying a few new dishes. I decided to also take along my mum as my guest as she had never tried Thai food before, so the evening at Thai Silk was a first for her. 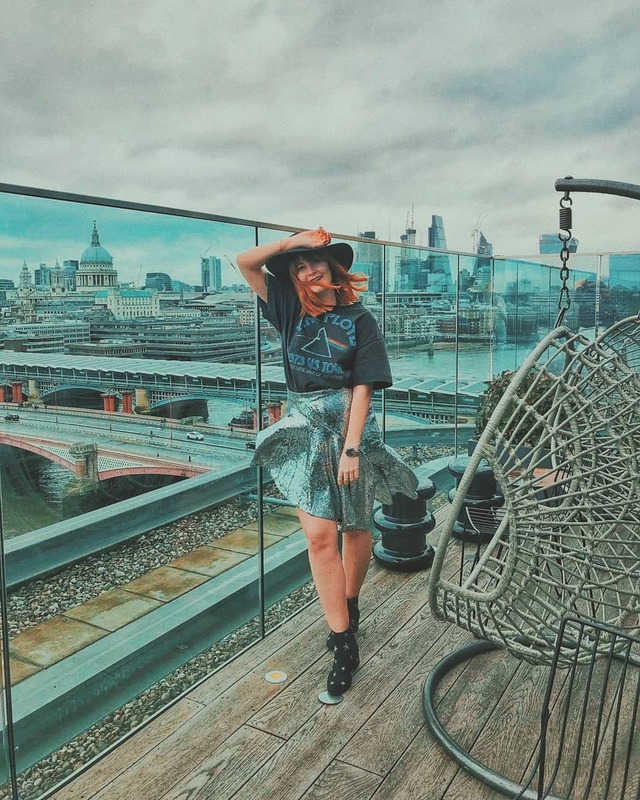 The restaurant is located quite literally a stone's throw away from Southwark tube station and less than a minute's walk. Upon exiting the station, you just simply follow the path to the back of the station and you'll find Thai Silk nestled amongst a number of other bars underneath the arches of the station. 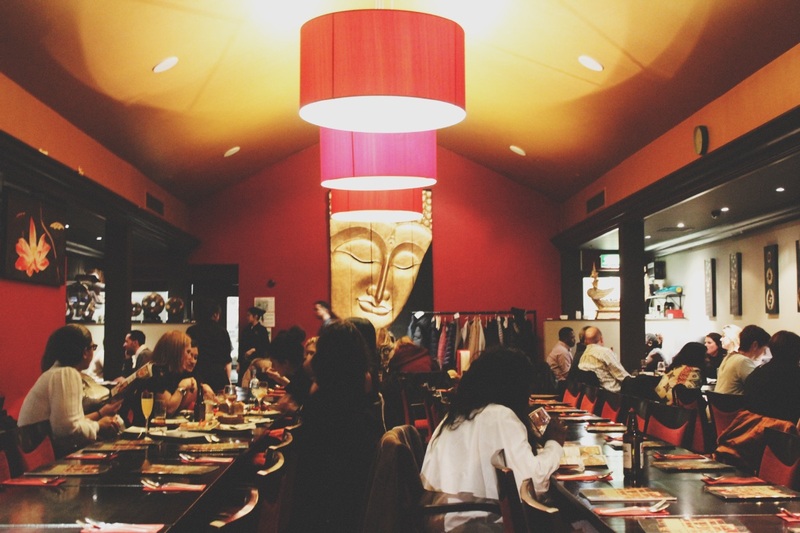 When entering the restaurant itself, it's actually quite overwhelming how far back the restaurant goes lined with tables and authentic Thai decor and artefacts. We arrived a little before 7pm on a Saturday and although it was quite empty at this time, it filled up quickly within the hour as lots of parties arrived and the atmosphere picked up to a lively weekend buzz! There's a space adjoined to the restaurant with a bar, lounge and open 'dance area' where they host a variety of private events, karaoke and on this particular night they had a DJ. Even if you're not looking to eat, you're more than welcome to enjoy a drink at the bar and a night on the dance floor. The music from the next room can be heard throughout the restaurant, but it wasn't overly loud. If anything, it added to the overall upbeat vibe of the restaurant. Outside the front of the restaurant is a large area for outdoor dining with patio heaters; unfortunately it's not quite suitable for this time of year, but it would be perfect with a cocktail or two in the summer months! Luckily for me, Thai Silk have a separate vegetarian menu listed, which made it really easy when choosing my selection. 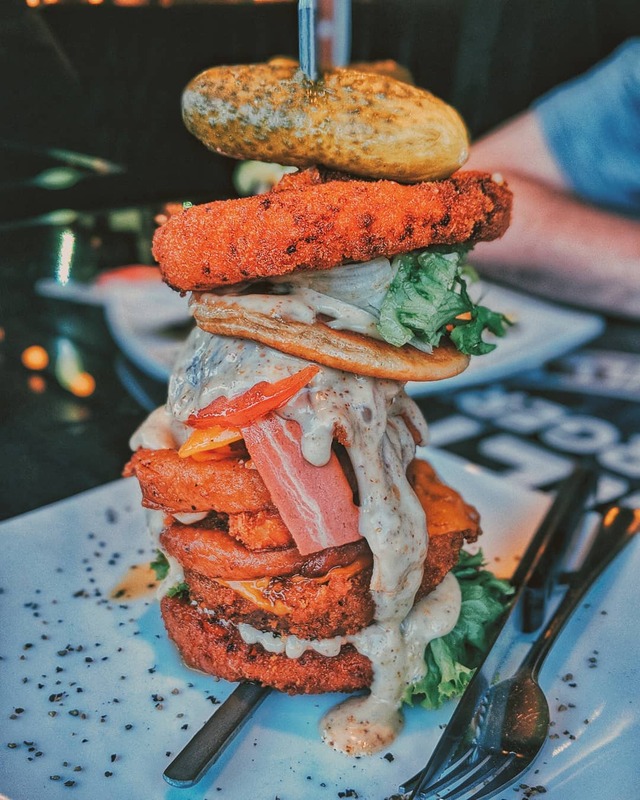 A lot of the time when eating out, I find myself having to ask our waiter or waitress whether they can confirm something is veggie-friendly before ordering, but in this instance there was no need at all. The menu itself is multi-paged and has a huge selection of dishes to choose from, so it's a good idea to check out the menu before you arrive to narrow down your choices! To begin the evening, I ordered the Tempura Pak, which is a selection of vegetables fried in a Tempura batter, served with a chilli sauce and salad to garnish. Whilst the vegetables had a great crunch to them, the tempura batter, although delicious, was a little heavy and I found myself ridiculously full after just my first course. I would recommend that if you're opting for the tempura dishes that it would be better to share between two, rather than one, as you're given quite a generous portion. For my main course, I decided to sample the traditional Thai Green Curry (Kaeng Kiew Wahn) with vegetables, a side of Coconut Rice and the Phad Broccoli. Without a shadow of a doubt, the aromatic and colourful vegetable Thai green curry was my favourite dish of the evening. 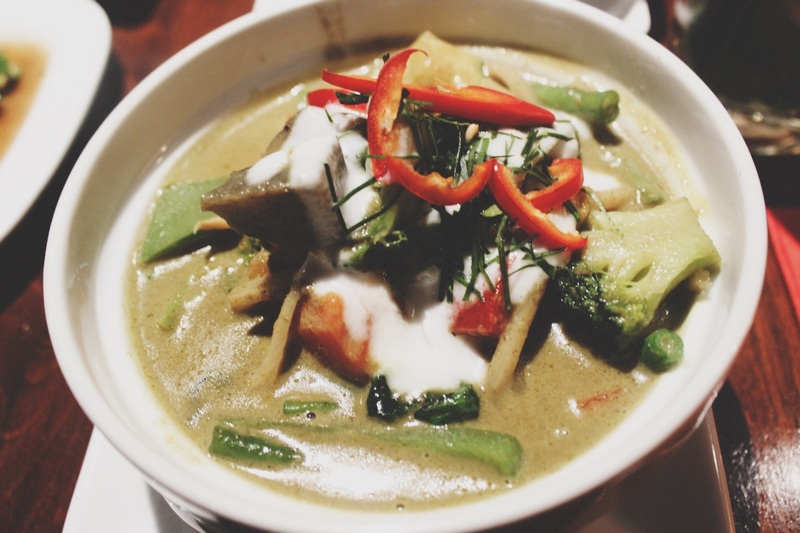 It was my first experience trying a vegetable-based Thai curry dish and in fact, it was so much more delicious than any meat-based green curries I've eaten in the past before I made the choice to switch to a vegetarian diet. The combination of textures and flavours from each of the vegetables work perfectly with the slightly spicy curry. As someone who enjoys spicy food, I didn't find the heat too overwhelming. However, my mum doesn't really eat spicy food that often and she did find it a little too overpowering for her taste. The coconut rice is topped with crunchy coconut flakes and is the perfect accompaniment to counterbalance the spices of the curry. 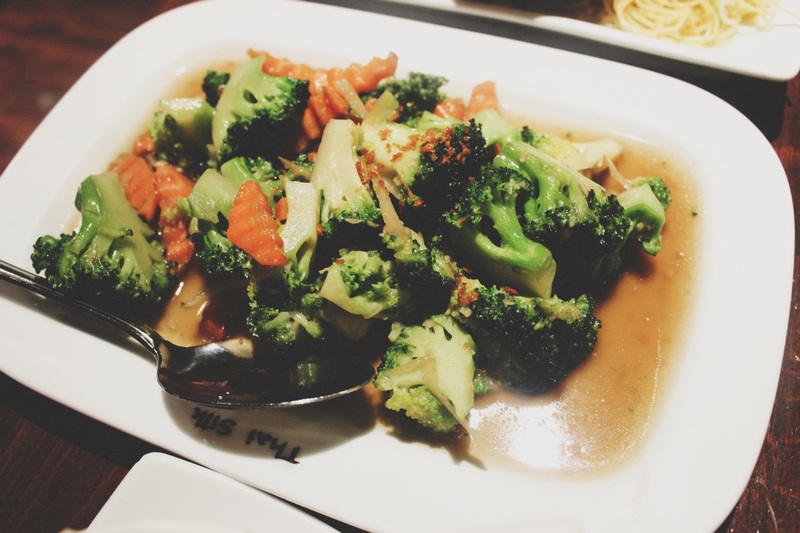 The side of broccoli and carrots are stir-fried with ginger and oyster sauce (noted on the menu as vegetarian) also made a great side dish to the rest of the meal; the vegetables were once again cooked perfectly with that firm crunch. Unfortunately after the heavy starter, I was too full to finish all of my main course and I couldn't even glance at a desert menu. My mum however still had room for desert and ordered the Khao Niew Ice Cream, which was a sweetened sticky rice with vanilla ice cream. It wasn't to my taste unfortunately, but I tend to dislike rice pudding. It was sickeningly sweet and a lot to stomach after a heavy meal, but would definitely be enjoyed by someone with a super sweet tooth. 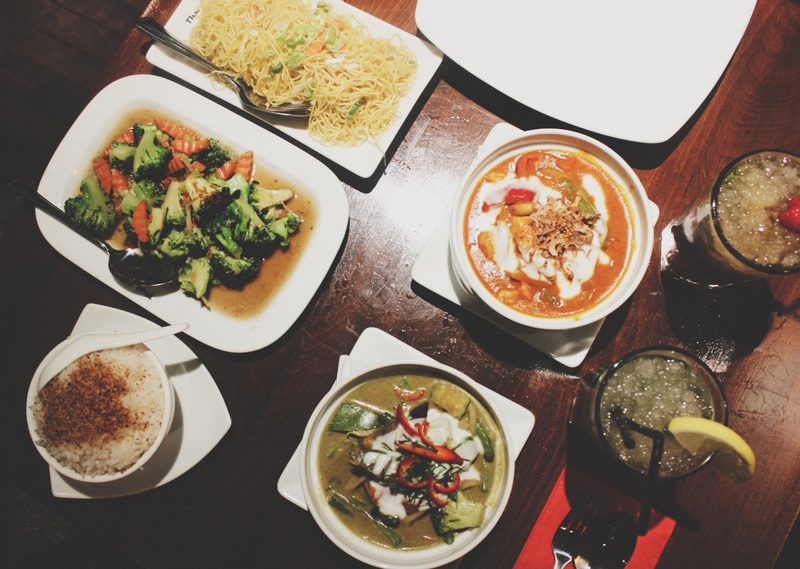 Thai Silk is a humble and reasonably priced restaurant that is in a convenient location. It's the perfect setting and atmosphere for an office party or getting together with your friends for dinner before a night out in the city. The extensive menu means that you can order a vast variety of dishes that should please everyone, including vegetarians. Thai Silk a restaurant that isn't trying too hard to be upmarket or niche, but delivers good, authentic Thai food and a thoroughly enjoyable atmosphere. Disclaimer: I was offered a complimentary meal in return for an honest review.